God might be responsible for Nigeria’s economy situation – Oyegun – Royal Times of Nigeria. The National Chairman of the All Progressives Congress (APC), John Odigie-Oyegun has said that God might be responsible for Nigeria’s present economic downturn, so drastic measures will be taken to reverse the situation, Order Paper reports. 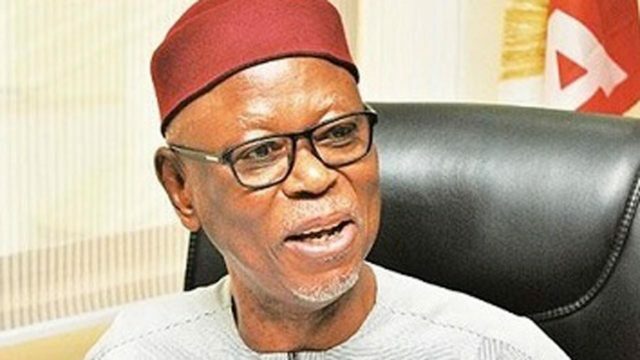 Odigie-Oyegun made this statement when Change Agents Foundation (CAF), an APC support group led by its Director-General, Felix Felix paid him a courtesy visit at the party’s National Secretariat in Abuja. “The concept of change is a difficult one. Nigeria must be ready to adapt to new ways of doing things. As a party, we know and understand it calls for tremendous sacrifice, there is no other way. Yes, the economy is in a bad shape, but maybe that is the kick we need to be innovative and find ways to drive the economy out of the woods. “The luck we have is that we have as president a man committed to personal probity and sincerity of purpose to the project of developing Nigeria. Today, we must think and be innovative in ways of fashioning out new economic models which diversify from the present over-reliance on oil.